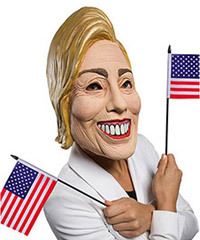 During the Halloween season, controversial and infamous people often become the subject or theme of a Halloween costume. So it's no surprise, you can shop for a controversial Halloween mask of one of the world's most notorious terrorist leaders, Osama Bin Laden or also spelled as Usama Bin Laden by the F.B.I. Due to the high level of terrorist activities, even more controversial terrorist masks and terrorist costumes have been produced. These Osama Bin Laden face masks and complete terrorist Halloween costumes for anyone who wants to dress up as the world's most notorious terrorist. Nothing seems to be too sacred for Halloween so check out these controversial Middle Eastern costumes available online on sale. This controversial "missile in the head" and "shot dead" terrorist Osama Bin Laden mask will get you lots of attention on Halloween night. 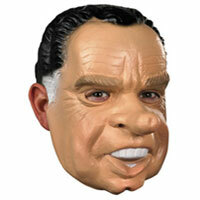 This caricature Bin Laden mask is a full overhead latex adult size mask that is hand-painted in detail. This clever costume creates an illusion that you are riding in a camel. Your legs go into the camel's hind legs, while the front legs are stuffed! The elastic shoulder straps hold the camel's body up. All you need to add is a Middle Eastern shirt and headdress to complete your costume! An adult cloth turban and beard accessory set for any Middle Eastern man costume. This is a white scarf headpiece with double bands. The is a standard size adult Arab, Iraqi, or Persian Halloween costume for men which includes the headpiece and layered robe. This white Arab costume gown includes velcro fasteners, brown belt, and headpiece designed like a keffiyah. This outfit will make you look like you are came right out of a middle eastern adventure. Bring back the world's most notorious terrorist from dead this Halloween night with this Osama Bin Laden Halloween costume with a missile through the head Halloween mask and a camo jacket and a robe.